Full size section with spinal cord and nerve branches. 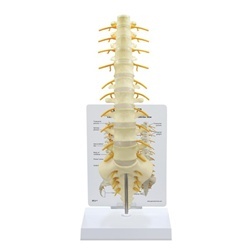 Bones featured are the sacrum, L-1 through L-5 vertebrae, and T12 through T8 vertebrae. This models is highly detailed normal anatomy that is fully articulating. Includes patient education card. Model Size: 4-1/2" x 3-1/2" x 16"